The weavers of stories are always wrestling with the concept of place. We want to give our characters believable settings and stages to perform on, and we personally yearn for comfortable environments to write them into the scenery. But behind the scenes, we authors are also trying to carve out and understand our own sense of place in the literary world. What is our place—our niche—in the land of creative thinkers? I found my answer through the example of the bee. Though I never paid much attention to him when he was alive, in his death, Muhammad Ali got me thinking. I started thinking about his catchphrase, asking myself, “Why float like a butterfly and sting like a bee?” Why were those his token animals? Insects at that! I mean, why not float like a feather and sting like a hornet or wasp? So, that Ramadan of 2016, I broke my no-TV rule in an attempt to learn all I could as fast as I could about bees and butterflies. I watched documentary after documentary on bees and their disappearance. For me, it was worth breaking my rule. It was inspirational…and a sort of revelation from Allah through nature itself. Alhamdulillah, besides inspiring me to change my favorite animal from the frog to the bee and rethink the life that I live, all of this information on bees oozed like honey into my speech for the 2nd Annual Muslim Women’s Literary Conference in Houston, Texas. MashAllah, what an honor it was to be to speak there! Admittedly, I felt extremely nervous to speak there – every other speaker was a published author of books (or about to have a book come out)! I was in the midst of true powerhouses, mashAllah. I mean, I got to do a little fangirling of some of my favorite people, such as The Size of a Mustard Seed, author Umm Juwayriyah. 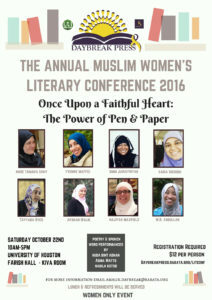 But that is what Daybreak Press is all about–raising and reviving the voices and narratives of Muslim women, as a spiritual and scholarly upbringing of women by women. I shared a panel with my publishing teammates: Afshan Malik (Rabata’s Program Manager) and Tayyaba Syed (co-author of the fantastically popular Jannah Jewels series). Our panel was entitled Happily Ever After(life) – an irresistible temptation given my proclivity towards Disney metaphors. So, unable to resist, I took flight at around 6am to go to Houston and deliver my speech entitled, “Just Let Me Bee: Guilt-Free Creative Living and Finding Your Niche in the Sandwich of Life” (all puns intended). Then I turned around and was home by midnight. The video is about 30 minutes…and in case you can’t see or hear everything (the mic cut out LITERALLY right before I spoke), I intend to publish the nectar of it all, tip-by-tip, in morsel-sized weekly blog posts on my personal blog, The Sandal, inshaallah 🙂 A big shout out to Umm Juwayriyah for filming me! 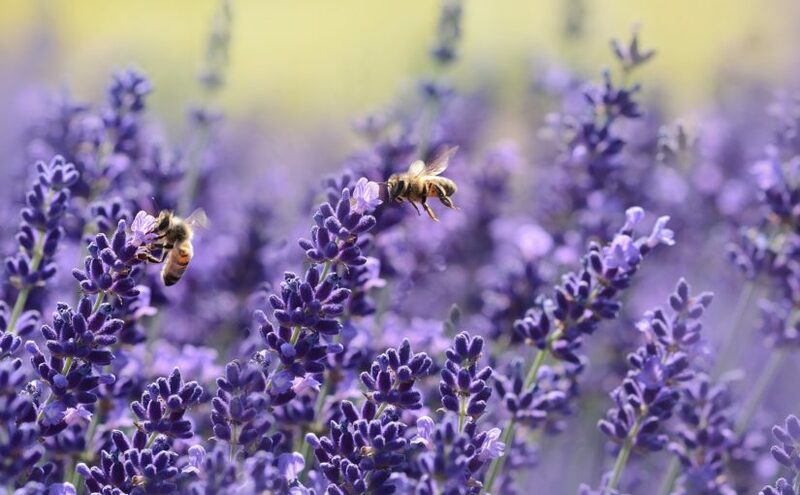 Truly, the writer is a gleaner and giver, just like the noble bee. We should never underestimate the gifts Allah has loaned us. A bee can carry its weight in nectar and honey…and still fly…while supporting her sisters and brothers in creation to do the same. Signup today to receive our online Rabata newsletter! Rabata promotes positive cultural change through creative educational experiences.